To eat like a Pro takes a lot of determination. When others are out indulging or enjoying deck parties over the summer months, most figure athletes are keeping a close eye on what they're eating and making sure they stay on track for the next big competition. People say it's hard, but it's really simple. You eat real, whole foods, and stay away from everything processed. Sounds simple, right? The difficulty lies in compliance. Figure athletes eat like a pro for a reason - they want results and they want all their hard work to show on stage. Directions: Mix all ingredients in high powered blender while frying pan is heating up. Don't let mixture sit too long, it will start to get thick. Pour into no-stick pan and cook like a pancake. I make one gigantic pancake the size of a dinner plate...but that's just me. Flip to cook on the other side then serve. 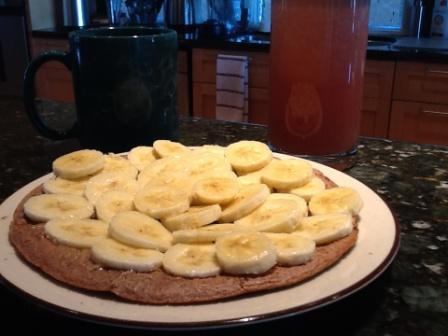 When it's done, place on a plate and use 1 Tbsp of organic almond butter to spread on the pancake and then top with one small sliced banana. *During pre-comp season this recipe is divided in half as calories are more closely regulated. If you're wondering what's in the cup and the glass in the background of the photo it's a cup of Cali tea and a glass of fresh ruby grapefruit juice. How do you make ruby grapefruit juice? Take 1/2 an organic ruby grapefruit, blend with 1 cup filtered water and there you have it - no added sugars, colours, artificial sweeteners, or chemicals - just fresh ruby grapefruit juice the way any figure athlete would enjoy it.